The sentinel stood guard 60 feet above Shiokaze Park in Odaiba, Japan, silent except for the occasional hiss of steam escaping from its joints. Below it teemed a crowd of onlookers who had come to witness the unlikely spectacle. To some, it was an astounding feat of engineering, a modern-day Colosssus of Rhodes. To others, it was a pointless (if impressive) curiosity. But whatever else the statue was, it was a mammoth celebration of popular culture: a full-scale replica of the titular robot from the groundbreaking Mobile Suit Gundam anime, built to commemorate the franchise's 30th anniversary. Make no mistake: Gundam is a big deal in Japan. 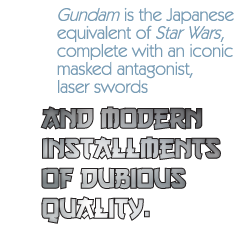 To put it in context for a Western audience, Gundam is the Japanese equivalent of Star Wars, complete with an iconic masked antagonist, laser swords and modern installments of dubious quality. But that comparison doesn't explain the presence of a 60-foot statue that took over two months and millions of dollars to complete. What's so special about Gundam, anyway? To understand why the Gundam franchise has such lasting appeal in Japanese culture, you must first understand why robots themselves are so significant in post-war Japan. Robots, after all, are a striking example of advanced technology and industry, ideas that have been central to Japanese culture for a century and a half. Since Commodore Matthew Perry sailed his ships into Japanese waters in 1853, Japan has undergone two successful periods of extremely rapid modernization: first as the feudal Tokugawa shogunate scrambled to catch up to the industrialized West, and again in the aftermath of World War II. After its defeat at the hands of the Allied powers in 1945, many Japanese were forced to confront the idea that they had been beaten, among other things, by the technological superiority of their foes, not the least of which was the terrifying might of the atomic bomb. Japan at that time was a weary, war-torn country, and the initial recovery was slow. However, once manufacturers repaired and replaced bombed-out infrastructure and the country grew self-sufficient once more, things sped up. Japan aggressively pursued manufacturing and industrial technology under the slogan "Catch up to and Surpass the Advanced Nations of the West." One of the new advances in technology that Japan's manufacturing sector quickly embraced was the industrial robot. Not only did robots make manufacturing much simpler, their ubiquity in Japanese factories became emblematic of the country's stated goal of modernization: They were a symbol that Japan was technologically advanced and fit to take its place on the world stage.